Simnel cake is one of the culinary delights of Easter. Never mind the icing on the cake, it’s that squidgy layer of half cooked marzipan sandwiched between the cakes which really does it for me. However, it’s not always the most popular of Easter fare and I wanted to make something that everyone would enjoy. Marzipan was a must and it makes a perfect partner for chocolate. But I felt a more subtle use of it was required on this occasion; I grated it into the cake batter and used it as the main flavouring for my surprise Easter Egg cupcakes along with lemon and a hint of cardamom. Scroll down to the bottom of this post to find the recipe. For my hidden surprise, I chose solid mini dark and milk chocolate eggs from Sainsbury’s. To cater to varied tastes, I cunningly used different coloured cupcake cases to denote which eggs were contained within. CT likened these surprise Easter Egg cupcakes to Bakewell tarts, but with chocolate rather than jam. For me they were a cake version of chocolate coated marzipan, but not so in your face. The marzipan flavours were there and gave a sticky enticing texture to the cakes, making them rather moreish. The chocolate caramelised slightly at the base creating a delicious crunchy layer. 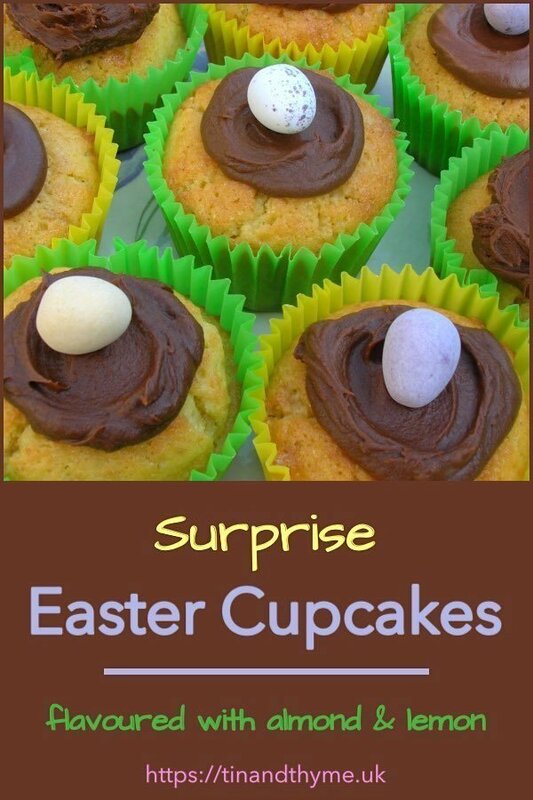 Great for children and adults alike, these surprise Easter Egg cupcakes are ideal for Easter picnics or an Easter afternoon tea. Shhh, don’t mention the hidden eggs and wait for the squeals of delight. This is an Easter hunt where everyone’s a winner. Thanks for visiting Tin and Thyme. If you make these surprise Easter egg cupcakes, I’d love to hear about it in the comments below or via social media. Do share photos on your preferred social media site and use the hashtag #tinandthyme, so I can spot them. For more delicious and nutritious recipes, follow me on Twitter, Facebook, Instagram or Pinterest. Surprise Easter Egg Cupcakes. PIN IT. If you didn’t mind spoiling the surprise, these almond and lemon Easter egg cupcakes would be fun bakes to make with the kids for Easter. As such, I am sending them off to Lou at Eat Your Veg and Vanesther at Bangers & Mash for Family Foodies where the theme this month is Let’s Get Baking. S is for Surprise Easter Egg Cakes for AlphaBakes this month with Ros of The More Than Occasional Baker and Caroline at Caroline Makes. I haven’t sent anything off to Emily at A Mummy Too for ages, so here these go to #RecipeOfTheWeek. Almond and lemon cakes made with marzipan and containing a secret treasure within - shhh, don't let on, there may be Easter eggs about. Grate in the zest from the lemon and beat a bit more. Sift in the flour and baking powder and fold into the mix along with the juice from half the lemon. Stir in the marzipan until just mixed. Place a teaspoon of the mixture in twelve cupcake cases. Sit the chocolate eggs on top, then cover with the rest of the mixture. Bake at 180℃ for 20 minutes when the cakes should be risen, golden and firm to the touch. Remove the the oven and allow to cool. Melt the butter, chocolate and syrup in a pan over gently heat and allow to cool slightly. Stir in the icing sugar and cocoa and beat until smooth and creamy adding the water towards the end. Use the icing to create 'nests' on top of the cakes and place an egg in the nest. Use different colour cases to mark what type of egg used - milk, dark, or white. I was sent some vouchers to purchase the ingredients needed. I was not required to write a positive review and as always all opinions are my own. Thank you for supporting the brands and organisations that help to keep Tin and Thyme blithe and blogging. I love the idea and sounds like something I could make with my children too. Love the bit in the middle – a nice surprise for your mouth! I love that you put chocolate and almond together in these adorable cupcakes! So cute! Oh! I love the inclusion of the grated marzipan! Great idea! Thanks Helen, the marzipan gives a good texture and a nice almond flavour without being overwhelming for the marzipan haters of this world – strange lot! I am loving your new look blog – fabulous! I know plenty of people that would enjoy these cakes particularly with the marzipan addition. These are cute – not too much frosting on top which makes them a winner with me. And who doesn’t love a hidden treasure! Thanks Claire, you are right and there is so much going on with these cakes anyway, you don’t need very much. Hidden cake surprises are such fun. I love the combination of chocolate, lemon and marzipan here. I am sure the flavours and textures are amazing. Thanks Anita and so glad you like the new site. I shall have to have a closer look at your French post card now. ahhh, the humble cupcake. The most perfect and adorable little Easter treats. I think the hard sugar coated chocolate eggs are my absolute favourite things ever! They do hark straight back to childhood and conjure up the joys of Easter treats. Thanks Johanna. Is simnel cake not something generally found in Australia then? If you like marzipan, it’s a must try cake. I love hidden surprise cakes! These cakes are very spring like and perfect for Easter. Thanks for entering AlphaBakes.